Florida tomato volume is rebounding as the recovery from Hurricane Irma continues. Meanwhile, double digit freights on potatoes from some states in the Western U.S. are occurring. Florida tomato shipments remain much lighter than normal thanks to Hurricane Irma last fall, that is fixing to change. Volume is gradually coming back as the replantings mature, but it will be around Christmas or perhaps early January before volumes return to normal. Irma dumped a ton of water of some fields, so use caution loading. There’s a chance of bacterial and general quality problems with some product, until a little later in the season. North American fall potato shipments in the most recent USDA update is pegged 505 million cwt. (per hundredweight), down 1 percent from last year. Canadian growers harvested 106 million cwt., up slightly from 2016, and U.S. growers are expected to produce 399 million cwt., down 2 percent from 2016. U.S. growers planted 906,500 acres, down from 923,800 in 2016, and harvested 900,600 acres, off from 909,600 in 2016. Canadian growers planted 345,800 acres and harvested 342,200, both amounts similar to the previous crop. The USDA reported yields per acre at 443 cwt. for growers in the U.S. and at 309 cwt. for growers in Canada. Potato shipments for Christmas are getting underway and truck rates from both Idaho and Colorado have increased 10 to 20 percent to many markets. Wisconsin, which has the lowest volume of the three states, is not experiencing volatility in rates. Idaho is shipping moving nearly 1700 truckload equivalents of spuds a week, although a significant amount of this is going by rail. Colorado is shipping around 750 truckloads per week, while Wisconsin is loading about 400 truckloads. The Columbia Basin and Umatilla Basin on the Washington/Oregon border has similar volume (about 350 loads) to Colorado and rates have generally went up 10 to 15 percent recently. Twin Falls area Idaho potatoes – grossing about $6300 to New York City. San Luis Valley Colorado potatoes – grossing about $2000 to Dallas. Stevens Point, Wisconsin area potatoes – grossing about $3300 to Atlanta. Washington’s Columbian Basin potatoes – grossing bout $5100 to Chicago. EAGLE, ID — The Idaho Potato Commission (IPC) launched its new television commercial during the Boise State University (BSU) vs University of Virginia (UVA) football game that aired live from Albertson’s Stadium in Boise, Idaho in late September. As a long-standing Bronco sponsor, this marquee game presented an ideal opportunity to unveil the seventh installment of the IPC’s  commercial featuring the Big Idaho Potato Truck, Farmer Mark and his ever-faithful hound. During the game ESPN reporters made it clear to their viewers they were in Tater Nation. From footage of the Big Idaho Potato Truck and non-stop shots of Spuddy Buddy, to a close-up of sideline reporter, Molly McGrath’s loaded baked potato, Idaho’s potatoes were treated like MVPs from the kick-off to the very last play of the game. The commercial airs through early April on popular networks like CNN, The Food Network, Headline News, Fox News and The History Channel, achieving more than 550 million audience impressions. To view it now, visit the IPC’s YouTube channel. Established in 1937, the Idaho Potato Commission (IPC) is a state agency that is responsible for promoting and protecting the famous Grown in Idaho seal, a federally registered trademark that assures consumers they are purchasing genuine, top-quality Idaho potatoes. Idaho’s growing season of warm days and cool nights, ample mountain-fed irrigation and rich volcanic soil give Idaho potatoes their unique texture, taste and dependable performance, that differentiates Idaho potatoes from potatoes grown in other states. The Boise State Bronco lost the game to Virginia University, 42 to 23. However, the Broncos have an 8-2 won, lost record. In typical fall fashion here are some of the better loading opportunities from four important produce U.S. shipping states. While apple shipments may not set a record this season, plenty will be available for hauling as another big crop is forecast. Last season harvest was so huge, believe it or not, some shippers are still loading “old” apples from last season. That’s okay, if your receiver is aware of it. Just make sure they know what is being loaded. Nearly 1800 truckload equivalents of apples are being loaded weekly primarily from the Yakima and Wenatchee valleys. Around 400 truckload equivalents of Washington pears are being shipped as well, with the best volume yet to come. Another big crop of Idaho potatoes will be shipped between now and late next summer. Nearly 1600 truckload equivalents of primarily russet potatoes are being loaded weekly from the four primarily Idaho shipping areas lead by the Idaho Falls area. Western Idaho and Malhuer County Oregon are shipping over 600 truckloads on storage onions per week. Last winter a number of onion storage sheds and other buildings were heavily damaged in Nyssa and Ontario, Oregon due to two separate winter storms, but adequate facilities appear to be in place for the new shipping season. Literally dozens of tropical fruits and vegetables are crossing the border from Mexico at Pharr, Texas, but a majority of the are in light volume at this point. Vine ripe tomatoes are perhaps providing the heaviest volume with about 500 truckloads per week. Limes may be among the heavier volume tropical fruits with nearly 350 truckloads weekly. Many Mexican items are just getting underway and in the coming weeks will provide better hauling opportunities ranging from strawberries to raspberries, honeydew, papayas and pineapples among others. The Lower Rio Grande Valley grapefruit harvest is barely underway with good volume arriving in November. Consumers are less likely to not buy Idaho-branded bagged russet potatoes due to price changes than potatoes from other states, according to a new study. The Idaho Potato Commission commissioned the study conducted by economist Timothy Richards of Arizona State University, which used retail scan data for the two-year period. The numbers indicate that Idaho potatoes have a higher consumer preference and can command a more premium retail price or markup. Pemsler said the findings suggest that if retailers don’t discount Idaho russets to the same degree as non-Idaho russets, there wouldn’t be a significant effect on volume sold. The study showed that overall price elasticity of bagged Idaho russets was 1.26 compared with 1.91 for bagged russets from other areas. The study breaks down data from the entire U.S. and eight separate regions over the two-year period, according to an executive summary of the research. In addition, Idaho potatoes are the least vulnerable to competitive pricing. Based on scan data of 5- and 10-pound bags, Idaho russet potatoes have the highest profit margin potential compared with potatoes from other origins. Bulk potatoes were not evaluated because of inconsistencies found in the data due to the nature of price-look-up stickers and misidentification of variety and brand/origin at checkout registers. Bagged potatoes represented 70 percent of all potato volume tracked during the two-year study. Pemsler estimated about 60 percent of retailers in the U.S. carry both Idaho and non-Idaho bagged russets. The data has not yet been published but more details are available from the Idaho Potato Commission at Seth.Pemsler@potato.idaho.gov. EAGLE, ID — Following an online “Fully-Loaded Idaho® Potato Cook-off” recipes event, Kenmore® awarded Crystal Schlueter’s unique and easy-to-make Mashed-Up Kimchi Reuben Tater Bombs with Sweet Onion & Gochujang Aioli the grand prize. The poppable hors d’oeuvres balance sweet onion, salty reuben, savory mashed potato filling, and spicy gochujang dipping sauce to create an unforgettable flavor experience. In November, participants entered their favorite holiday-themed recipes to showcase their love for Idaho® potatoes. Kenmore® selected four winners, including a “Social Spud,” the most liked recipe on social media channels. Established in 1937, the Idaho Potato Commission (IPC) is a state agency responsible for promoting and protecting the famous “Grown in Idaho™” seal, a federally registered certification mark that assures consumers are purchasing genuine, top-quality Idaho® potatoes. Idaho’s growing season of warm days and cool nights, ample mountain-fed irrigation, and rich volcanic soil give Idaho® potatoes their unique texture, taste and dependable performance, which differentiates Idaho® potatoes from potatoes grown in other states. For contest requirements and judging criteria see our news post from Nov. 17, 2016. Here are the current top five fresh potato shipping regions when it comes to volume being loaded on a weekly basis: Idaho, Colorado, Columbia Basin in southern Washington and Umatilla Basin in Northern Oregon, Wisconsin and the Red River Valley. For this season Idaho harvested 323,000 acres , totaling 13 billion pounds of potatoes — enough to fill 500 football stadiums 10 feet high. This accounts for one-third of all U.S. potatoes. Idaho is now shipping over 2000 truck load equivalents of potatoes a week. Idaho potatoes are easily the biggest volume U.S. produce item currently being shipped. Idaho potatoes – grossing about $5400 to Boston. In Colorado’s San Luis Valley, about 750 truck loads of potatoes are being loaded each week. Colorado potatoes – grossing about $1600 to Dallas. In Washington state, fresh potato shipments are coming from the Columbia Basin, Skagit Valley, and Klamath Basin. Washington State potato growers boast of the highest yields in the world, but total shipments each week are well below Idaho and even Colorado. About 13 percent of Washington’s overall crop is shipped for the fresh market. Washington’s Columbia Basin and adjacent Umatilla Basin in Oregon is averaging around 500 truck loads of potato shipments weekly. This volume leans heavily towards specialty potatoes. Columbian Basin/Umatilla Basin potatoes – grossing about $5400 to Atlanta. Meanwhile, Central Wisconsin accounts for the bulk of the Badger state’s potato shipments – currently averaging about 375 truck loads per week. Wisconsin potatoes – grossing abut $2600 to Atlanta. The Red River Valley of eastern North Dakota and western Minnesota is shipping about 175 truck loads of red potatoes each week. North Dakota and Minnesota Red River Valley potatoes – grossing about $1750 to Chicago. EAGLE, ID — Attention food fanatics and chefs extraordinaire! During the month of November enter your favorite Idaho® potato recipe for a chance to win a $1,500 cash prize, a myriad of kitchen appliances from Kenmore® and a 15 lb. bag of fresh Idaho® potatoes. In addition to the prizes awarded for first, second and third place, a $500 “Social Spud” prize will be given to the recipe receiving the most “likes” on the contest page, encouraging contestants to share their recipe entry on their social media channels. Recipes will be reviewed and tested by representatives from the IPC and judged on their combination of creativity, taste, ease of preparation, and, of course, use of Idaho® potatoes. Winners will be notified by December 10, 2016. The winning recipe will be featured on the IPC’s website and social media channels. 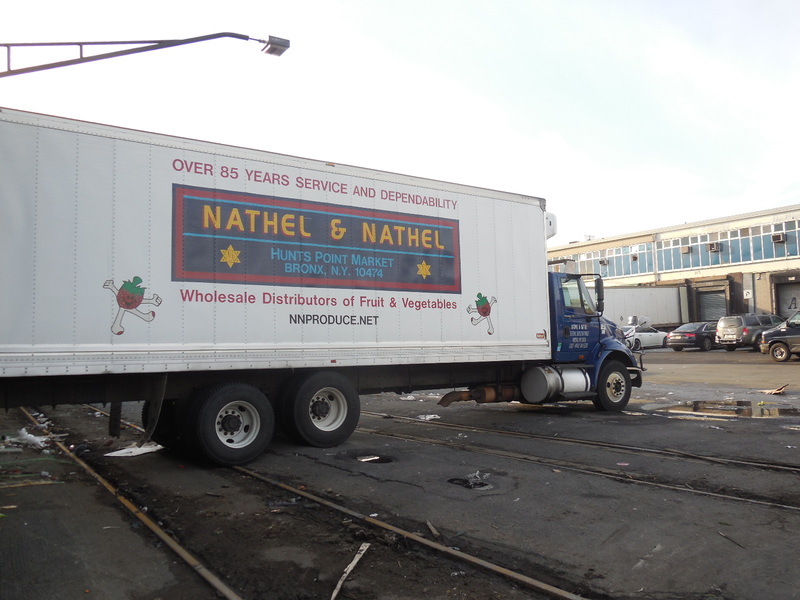 Nathel & Nathel Inc. has expanded operations on the Hunts Point Terminal Market located in the South Bronx of New York City. The New York-based wholesaler has added refrigeration capacity, reconfigured its fruit and vegetable divisions and improved its docks for truck loading and unloading. Following the closure of Krisp-Pak Sales Corp. in 2012, Nathel & Nathel took over its units and was working on closing on the purchase of units from the defunct Korean Farm, which went out of business in 2014. Nathel & Nathel now distributes produce from to 23 units. The distributor also upgraded the warehouse to Hazard Analysis and Critical Control Point standards. Better refrigeration control in different zones will result from the improvements, according to company vice president Sheldon Nathel said. It also should result in better temperature control for fruits and vegetables as well as better organize the operation, making it more efficient. Nathel & Nathel sells a full line of fruits and vegetables, including tropicals and specialties, to customers throughout the Tri-State region. The Hunts Point Terminal Market occupies 329 acres and supports 115 private wholesalers that employ over 8,000 people. Hunts Point wholesalers are paying a freight rate of about $5000 from the Lower Rio Grand Valley of Texas for fruits and vegetables, and about $4800 for Idaho potatoes.